State Universal Store – a large shopping mall in the center of Moscow, a monument of pseudo-Russian architecture, which occupies a quarter of Kitay-gorod and out of the main facade of the Red Square. The complex of buildings of the Upper Trade Rows designed by architect Pomerantsev. The main building is located opposite the Kremlin wall, the main entrance into the ranks was arranged in the center of the facade on the Red Square. The back of the main building overlooks the Vetoshny lane, where there is one more housing rank. The main building erected as a passage – popular in the European architecture of the second half of the XIX century, such as commercial buildings, where stores are located in tiers along the sides of a wide pass-gallery with glazed ceiling. The building consists of 16 buildings, connected by three longitudinal and three transverse galleries (“lines”). The construction is made in the pseudo- Russian style, decorative elements borrowed from Russian monuments. The giant three-storey building consisting of three longitudinal passages with deep cellars housed more than a thousand shops. At the beginning of the XXI century survived only about 30 original “Shukhov’s” steel structures. The building is constructed of three large halls. Used in the exterior Finnish granite, Tarusa marble, sandstone. At the site of dilapidated stalls XVIII century, Catherine II ordered to start designing a grand shopping center in the classical style. The project has developed itself Quarenghi, but construction was the city architect in a hurry, and the end has not been notified. After the fire of 1812 trade rows rebuilt another master of classicism, Osip Bove. The Upper Trading Rows occupied a special place in Russian. This is the largest shopping arcade belonged an important role in the economic life of the country. In 1869, it considered the issue of the reconstruction of a trading complex, since the upper ranks this time dilapidated and outdated. The owners of stalls have created their own committee to restructure the rows. In 1880, the City Council requested the government is to rebuild the ranks. But this initiative was not enough support and lost. In 1886, the The Upper Trading Rows were closed under the pretext of the accident. Stalls have been moved to temporary buildings on Red Square. The decline of trade was so strong that shopkeepers have decided to begin reconstruction. 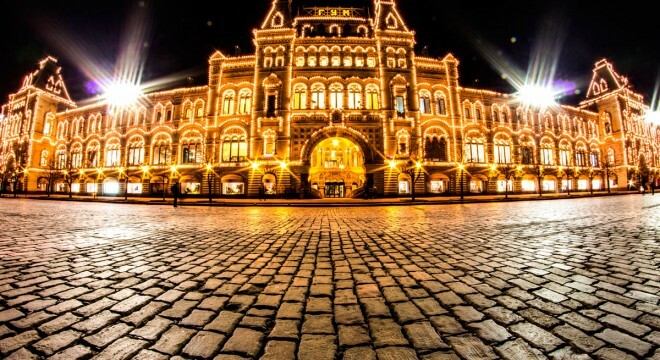 In November 1888 it was declared a closed architectural competition, which received 23 project; one of the conditions of competition would match the new look of the style of buildings other buildings Red Square. Reconstruction of the old building began in the autumn of 1888, a year later started the construction of foundations, and the official ceremony of the new building took place on 21 May 1890. In 1923 the building was opened in the State Department Store (GUM). GUM has experienced a lot of restoration work to reach our time in the form in which we know it. In 1990 the store was corporatized, and in 1992 – was privatized. The store ceased to be a government, but the name of the “GUM” saved and used concomitantly with the old name – “The Upper Trading Rows”. In 1997-2001 and in 2011-2012 were carried out restoration work fragmentary. Nowadays, trade complex is in rent until 2059 from the Russian retailer Bosco di Ciliegi, which specializes in the sale of luxury goods.